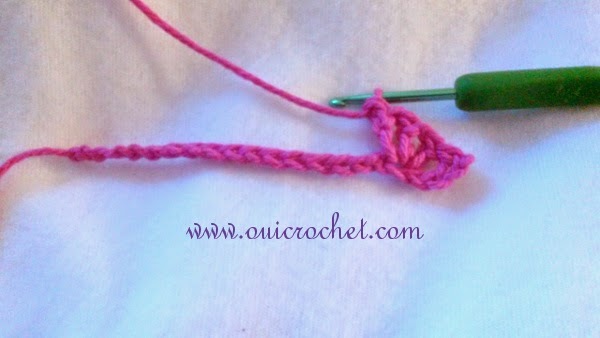 Today, I am going to show you how to do a fun and stylish stitch called the Open Shell and Picot Stitch. This stitch is not only pretty, but it has a lovely drape, so it is perfect to use for a throw, a shawl, or a light wrap. It would be nice for an elegant swimsuit cover, too. 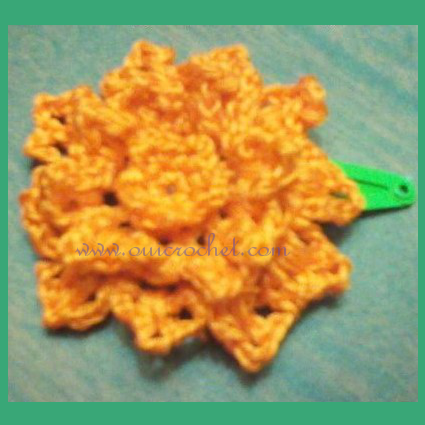 The open shell and picot stitch is easy to work. 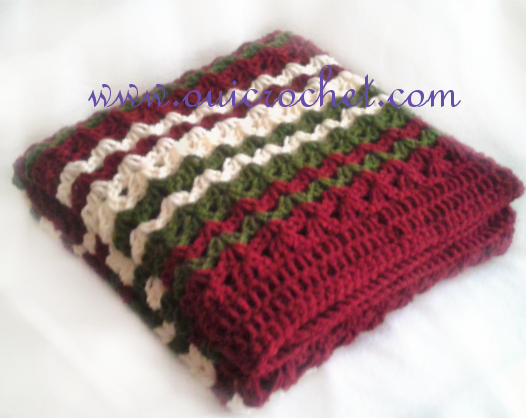 It is made up of single crochet, double crochet, triple (treble) crochet, and chain stitches. The main pattern simply alternates 2 working rows. To get started, you will need a foundation chain with multiples of 7 sts, + 1. For this tutorial, I started with 22 chains (7x3=21+1=22). Row 1: Sc in 2nd ch from hook, *skip 2, (dc, ch 1, dc, ch 1, dc) in the next ch, skip 2, sc in next ch,** ch 3, sc in next ch. Repeat from * ending your last rep at **. Turn. Row 2: Ch 7 (counts as tr and 3 ch) *work (1 sc, ch 3, 1 sc) in the center dc of the shell (this is the picot), ch 3,** 1 dc in next ch 3 space, ch 3. Repeat from* ending your last rep at **. 1 tr in last sc. Turn. Row 3: Ch 1, 1 sc in tr, *skip next ch 3 space, (dc, ch 1, dc, ch 1, dc) in center of next picot, skip next ch 3 space, ** (1 sc, ch 3, 1 sc) in next dc, repeat from * ending last rep at **, 1 sc in 4th ch of ch 7. Turn. 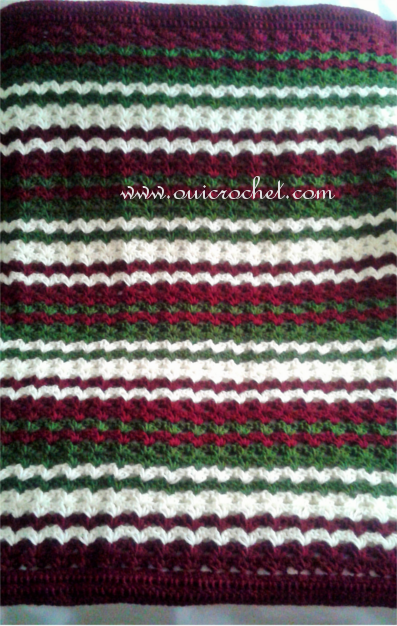 Pattern: Repeat rows 2 & 3. Now, let's break it down with photos. sc in next ch,** ch 3, sc in next ch. Repeat from * ending your last rep at **. Turn. 1 dc in next ch 3 space, ch 3. Repeat from* ending your last rep at **. 1 tr in last sc. Turn. repeat from * ending last rep at **, 1 sc in 4th ch of ch 7. Turn. Repeat rows 2 & 3 for the pattern. There you have it! 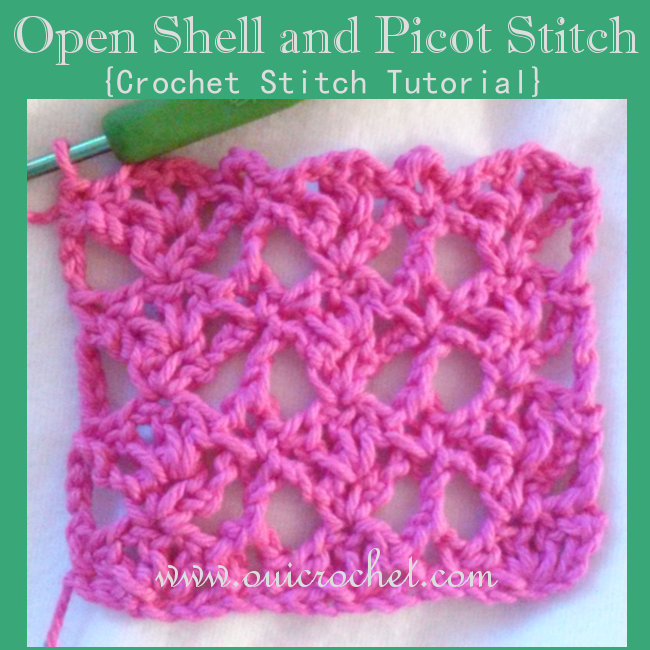 What will you use the Open Shell and Picot Stitch for? 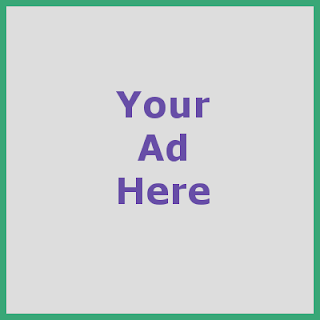 Please leave a comment here, and share your works on my Facebook page! With summer coming (those of you in the northeast, I PROMISE, it is coming!) we have to remember to drink plenty of water, so having a water bottle on hand is pretty convenient. Having to lug said water bottle around with you everywhere you go... not so convenient. UNLESS, you have a really cool and stylish water bottle carrier. 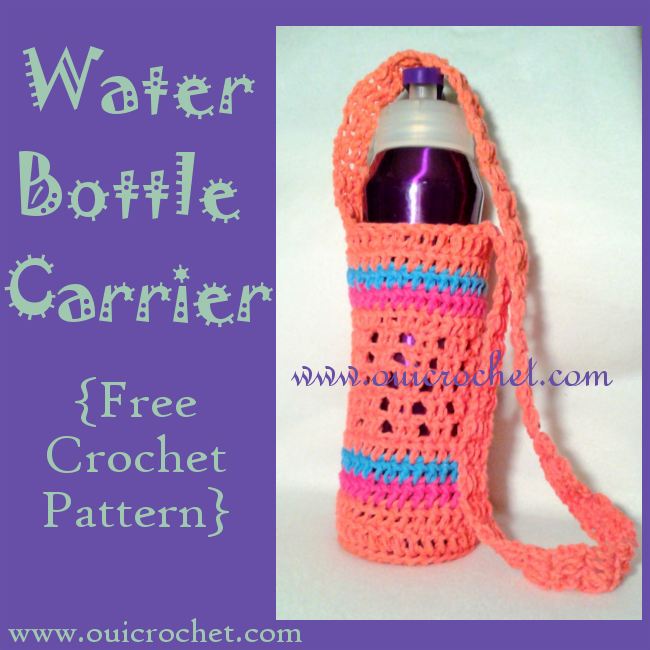 This water bottle carrier is not only cool and stylish, it is fun, handy, and easy to just sling over your shoulder. You can use whatever colors strike your fancy, and you can even make the strap a bit longer to fit across your body, if you prefer that style. 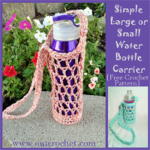 I wanted to do something a little fun with the stitching for this water bottle carrier, so included a modified double crochet stitch. 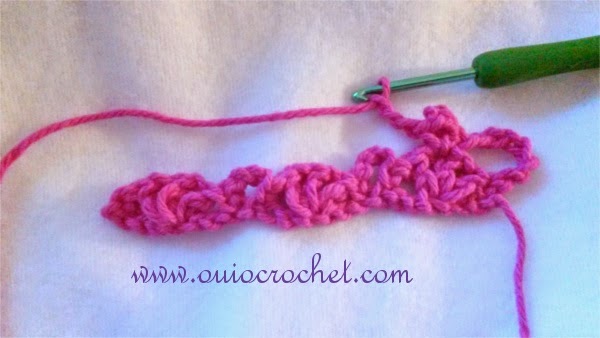 The modified double crochet stitch has a slightly different look than the traditional double crochet stitch. It is easy to do, too! Let's get started! 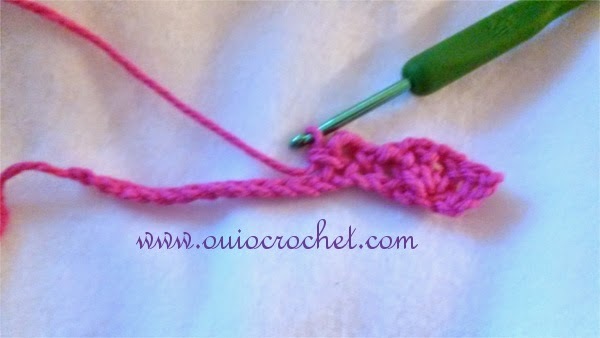 Modified double crochet (mdc)- yo, insert hook into next st, yo and pull through st, yo and pull through one loop on hook, yo and pull through all three loops on hook. Ch 3, join to first ch with sl st to form a ring. Round 6: Repeat round 5. Round 7: Repeat round 5. Round 8: Repeat round 5. Round 16: Repeat round 15. Round 17: Repeat round 15. Count 12 sts on the main piece, skip those sts so that when you join, you will have an even number of skipped sts on either side of the strap. Making sure your strap isn't twisted, and working through both the strap sts and main piece sts, sl st 4, sl st the turning ch 2 onto the next st.
Everyone needs a stylish belt in their wardrobe, right? Why not crochet one? This belt has texture and style, and looks nice with casual jeans, or can add that special something to accent a cute dress! The stitching in this belt gives it a desirable texture and adds character. No boring ol' belt, here! I chose neutral colors, but you can certainly jazz it up with wild, vibrant colors if you wish. 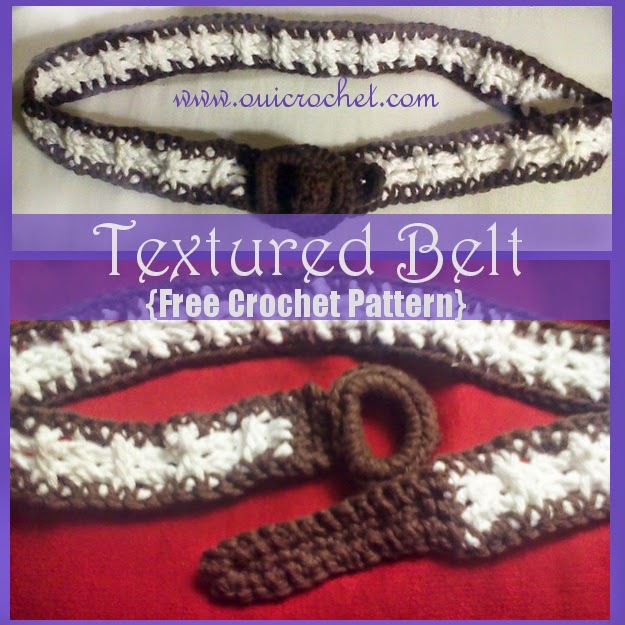 This textured belt can be crocheted to any length you wish. Once you have the length that fits, switch to working the (narrower) end of the belt. The end is the part that will be threaded through the D rings to fasten. The belt end is the perfect length, so that there is no (sloppy) hanging flap. This makes for a neat and classy appearance when pairing it with a dress or long shirt. Join color A to D ring with a sl st and sc 25 around ring. Join to first sc with sl st.
Ch 1, sl st to second D ring and sc 25 around. Join to first sc with sl st.
*tip: make sure you start and end in the corner of the D ring. Ch 1, place D rings together, working on the flat side of the rings, and working in the back loop only of the front ring and the front loop only of the back ring, sc 4. Turn. Row 1: Ch 1, sc 4. Turn. Row 2: Ch 1, sc 4. Turn. Row 3: Ch 3, skip the first sc, dc in the next 3 sc. Turn. Row 4: Ch 3, work a front post dc in the first dc of the previous row, work a front post dc in the next dc of the previous row, dc in the top of the ch 3 from the previous row. Turn. Rows 5- ? 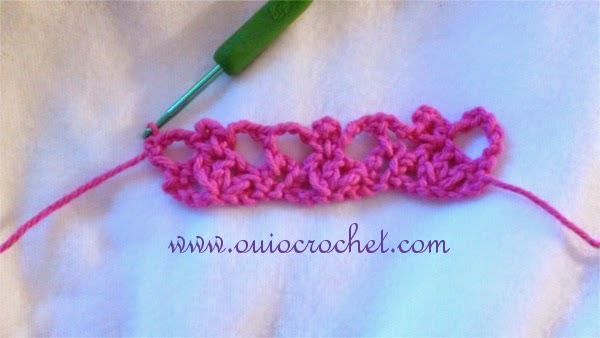 : Repeat row 4 to desired length. Next Row (we will call this Row 1): Ch 1, [sc 2 tog] twice (this includes the top of the ch 3). Turn. Rows 2-11: Ch 1, sc 2, turn. Row 12: Ch 1, sc 2 tog. Finish off. Join color A to the side of the first row, just after the D ring. Ch 1, sc around entire belt. My original pattern called for only 2 colors. The flower center was the same as the headband. Well, my 4 year old insisted that this flower needed have a blue middle. Who am I to argue? Turns out, she made a good call! I like this one even better that the originals! Little did I know, her interest in this project was went beyond a flower's blue middle. When I showed her the finished product, she promptly put her order in for "a stwiped headband wif a butterfly on it". I guess I know what I will be working on next! 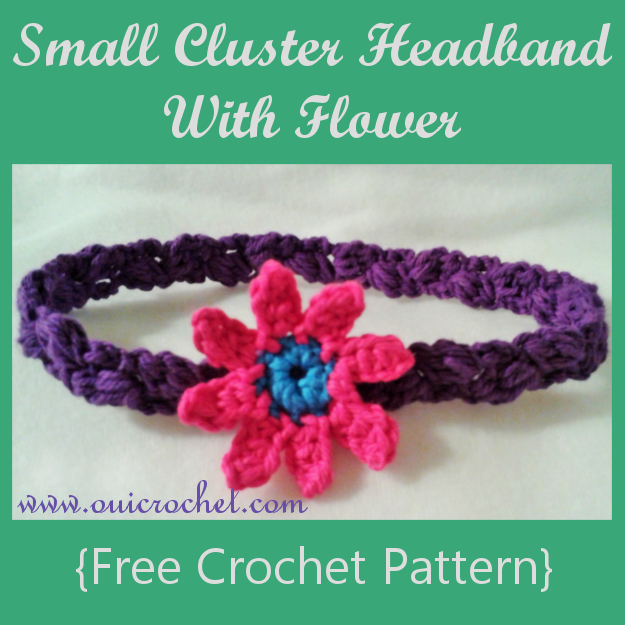 This small cluster headband is quick and easy to make. 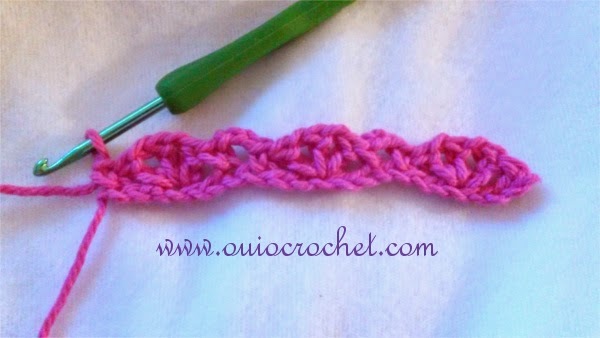 The clusters are stacked one upon another, giving the headband a nice texture with almost a braided look. The flower is worked in three simple rounds, the third being the petals. 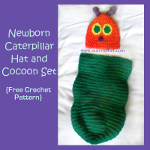 You can easily customize the colors, or even use a different applique (say... a butterfly, for instance). The flower applique can also be used in various projects. 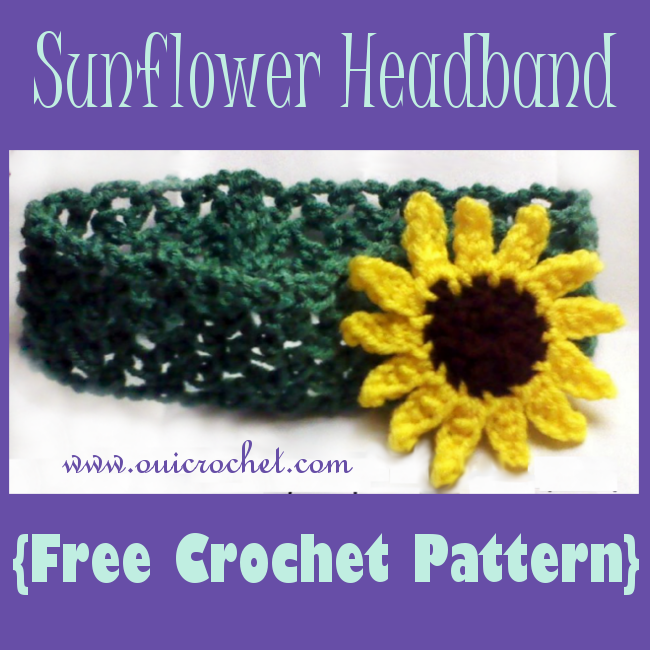 This headband makes a great gift or a quick item to fill your craft booth. Small Cluster (cl): [yo, insert hook and pull loop through, yo and pull through 2 loops on hook] repeat 2 more times. Yo, and pull through all 4 loops on hook. Cluster made. Row 2: Ch 3, cl in top of previous cl. Turn. Rows 3-? 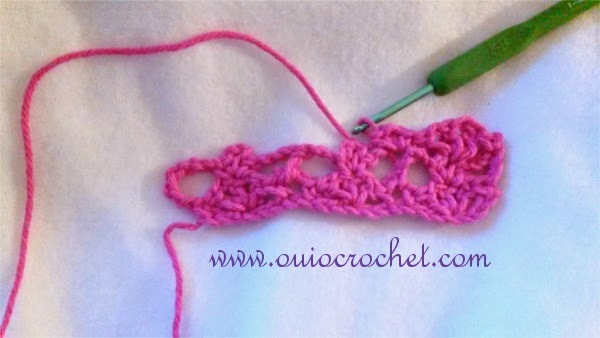 : Repeat row 2 to desired length. I needed 27 clusters for my 11 month old. You can use my Hat and Headband Size Chart to determine the length you need. Join with sl sts to make a circle. Leaving about a 6 inch tail, ch 4, sl st to first ch to form a ring. Round 1: Ch 1, work 8 sc in ring. Join with sl st to first sc. Finish off. Switch to new color, and join to first sc. Round 3 (the petals): [ch 4, sc in second ch from hook, hdc in the next 2 ch, sl st in the next sc of the base.] Repeat around, joining the last with a sl st to the base of the first petal. You will have 8 petals. Finish off, leaving another 6 inch tail. Weave tails to back side of the flower center. 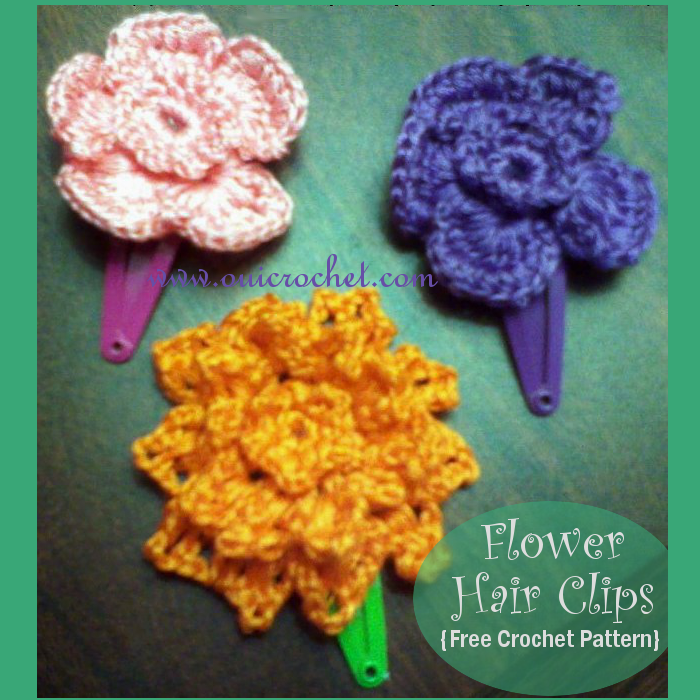 You can use these to sew flower to headband. Secure flower to headband and weave in all ends. 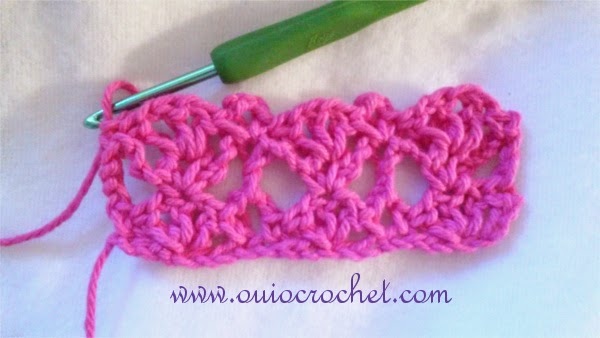 Do you like this headband pattern? Check out my Pattern Gallery for more. 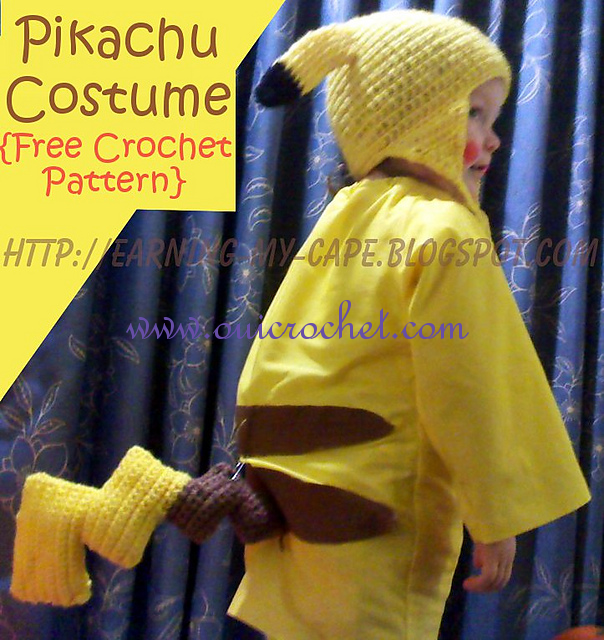 When my daughter was two, she decided (last minute) that she wanted to be Pikachu for Halloween. Luckily, I was able to make a quick, impromptu, costume for her. This made her a very happy little pokemon! I was going to add Pikachu cheeks, eyes, and a mouth to the hat, but she needed to be the one to have the little red cheeks, so I left them off of the hat. I will leave you to choose to add them to your hat, or not. The tail is made in 2 pieces, because I was "winging it" and it seemed to be the easiest option. It didn't take long at all to make. Note: The hat fit my 2 year old for well over a year. If you need a different size, you can check out my Hat and Headband Size Chart, and make any necessary adjustments. ** Beginning ch 3 does not count as a dc. ** When you join at the end of the rounds, you you will simply join with a slip stitch to the first dc made in the previous round. 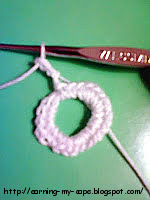 Ch 3, join with slip stitch to first ch to form a ring. Continue counting around the rim of the hat (from the 10th dc of first row of the ear flap), skip 20 sts, reattach (bright yellow) yarn in the 21st stitch. Sc around entire hat, including ear flaps. Fold 6 long strands of yarn through the bottom of each ear flap. Braid to desired length. Tie off and trim. Finish off, leaving a long end for sewing. Sew the ears to the hat and weave in all ends. 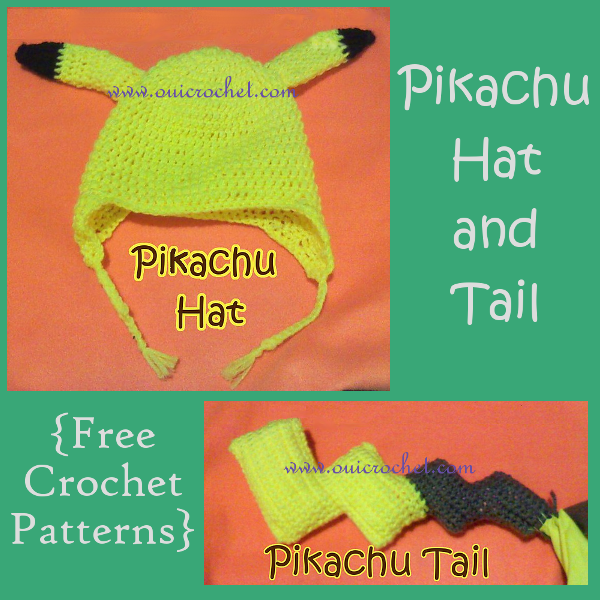 If you wish, you can make little Pikachu eyes, nose, mouth and cheeks, and sew them on the front of the hat. Finish off and attach yellow to the first sc in row 13. Line both pieces up together, and starting with yellow, use yellow yarn to sew pieces together (you will not sew the brown part yet). Finish off. Stuff lightly, but enough for the tail to hold shape. Now, use the brown yarn to begin sewing the brown part together. Leave a small opening for stuffing. Stuff, then finish sewing it up. Finish off and weave in all ends. Secure to costume with some sort of a clip or strong safety pin. 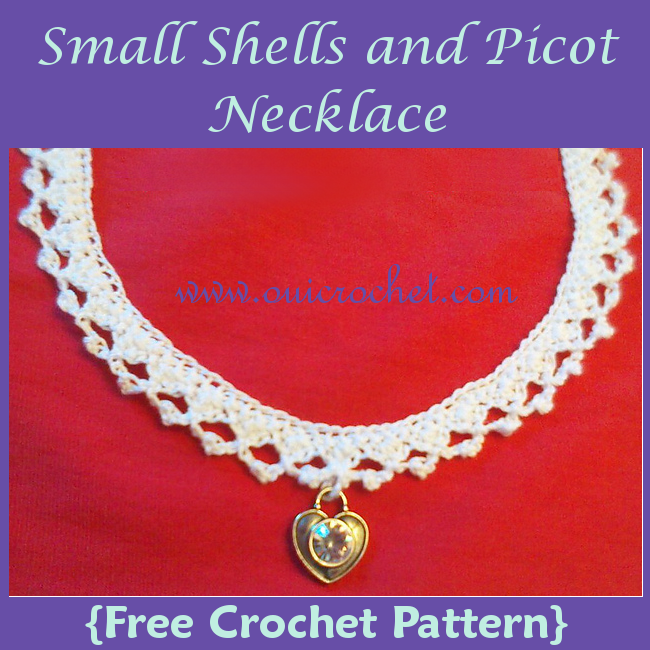 I have shared with you my Picot Necklace, and my Small Shells and Picot Necklace. 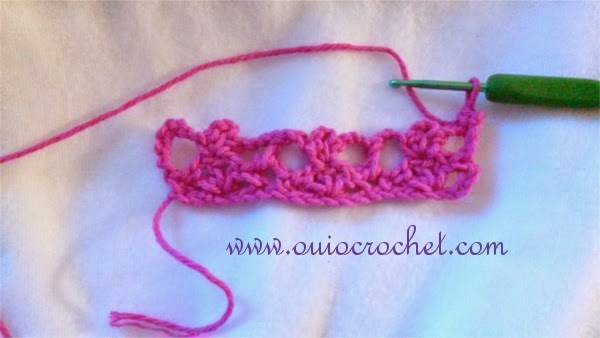 Today I will be changing up the picot just a bit by adding beads. 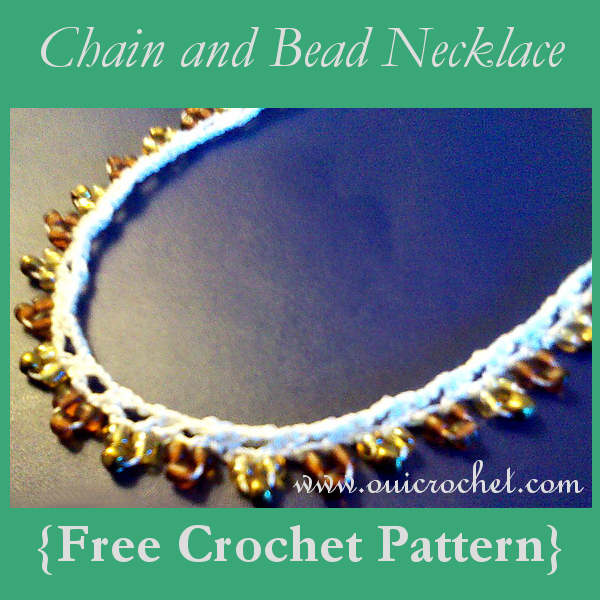 The beads will act as a fun and elegant "picot" in this Chain and Bead Necklace. I have instructions in 2 sizes for this necklace, but you are free to make it any length you wish by simply adjusting the number of beads you use. This fun necklace allows you to get creative with bead colors and thread colors. 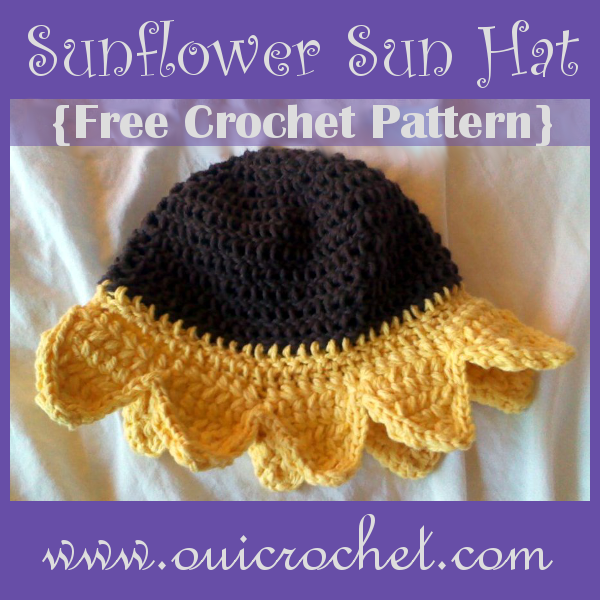 It is easy to make, and makes a wonderful gift or craft booth item. A button for the "clasp" or you can make your own. Pull out the end of your thread, and start stringing your beads directly on it. Continue that across, until there are no more beads. Starting at the end (the one you strung the beads on), Ch 9. Sc in 2nd ch from hook and in next 7 ch. Turn. Ch 1, sc 8, ch 1 and sc across the back side of the foundation chain, sc 1 in the short side. Ch 20, [skip 3 beads, slip stitch, ch 3] repeat across until there are no more beads. Do not ch 3 after the last group of beads. Ch 30, slip stitch in the 10th ch from hook. Working around the other side of the unworked thread, sc 12 inside the ring. Sc in the first ch from the ring and in the next 20 ch. [Ch 3, sc in the middle ch between the next two 3 bead clusters] repeat across. Sc in the 2nd ch after the last 3 bead cluster. Sc in each of the remaining chains. Sc into end piece and in the 8 sc across. Finish off, weave in ends, and attach button. A while back, my son needed a strap for his guitar. I thought I would make one. 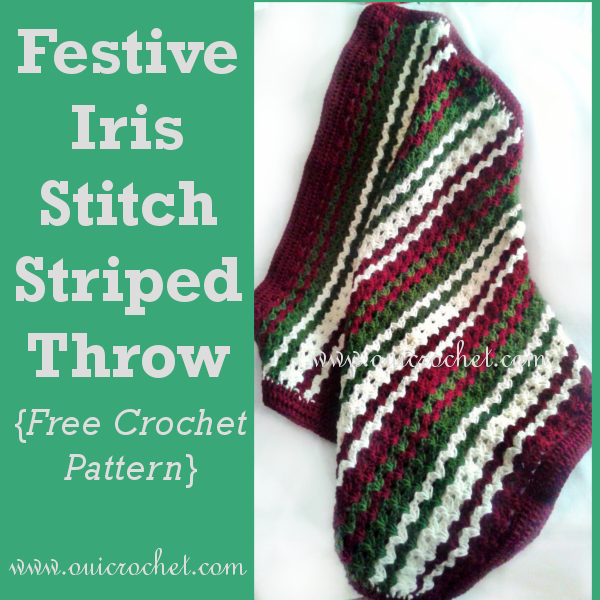 I wanted to make something strong and sturdy, so I chose a Tunisian stitch. We were both very happy with the result! 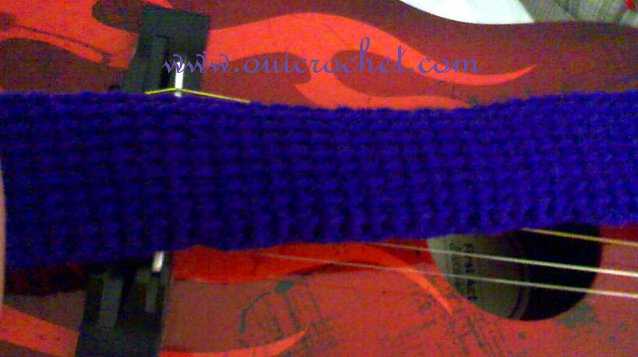 The guitar strap can be made custom to the length you need, and it can be embellished with fun appliques, if you wish. 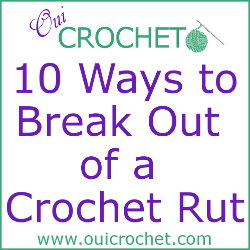 This project is perfect if you are just learning Tunisian crochet. 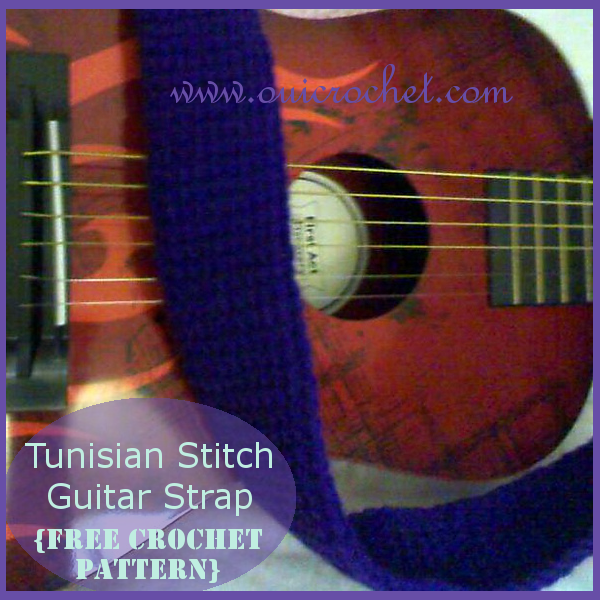 If you are looking for more Tunisian stitch practice, check out my Tunisian Stitch Belt Pattern. Afghan Stitch- Insert hook in the first sc, draw up a loop, keeping loop on hook, continue to insert hook in each sc and draw up a loop through the next 7 sts, DO NOT TURN. Work the return- Yo and draw through the first loop on the hook. This loop will drop from the hook. Yo and draw through 2 loops. 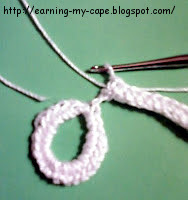 Continue yo and draw through 2 loops until there is 1 loop left on the hook. DO NOT TURN. 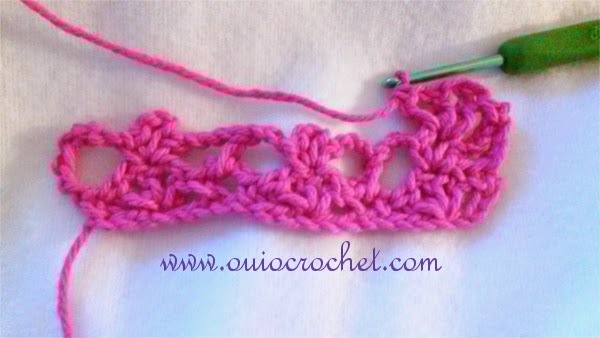 Skip the first stitch and insert hook right to left under the first vertical strand of the next stitch of the row below, and draw up a loop. 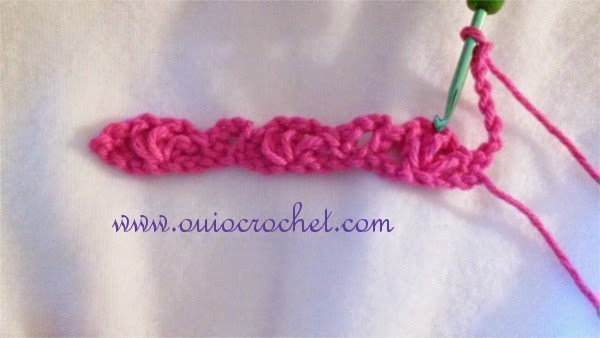 Continue to draw up a loop in this manner for each stitch across. Work the return as above. Row 7 to ??? 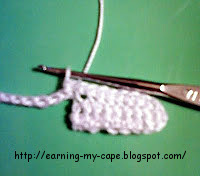 : ch 1, work Tunisian stitch to desired length. Do not finish off. ch 1, sc 2, ch 5, sc in next sc, sc. Finish off. 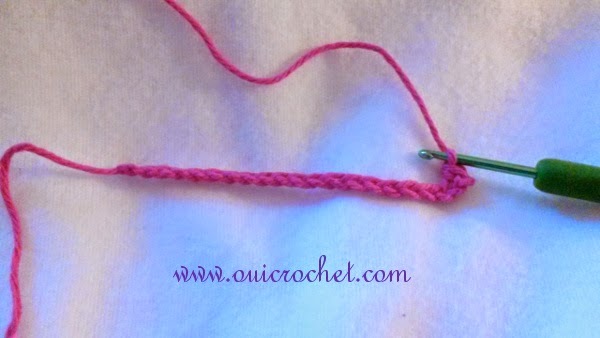 Reattach yarn to the beginning end with a slip stitch. Slip stitch in the 2nd ch, ch 5, slip stitch in the last 2 sc. Finish off. 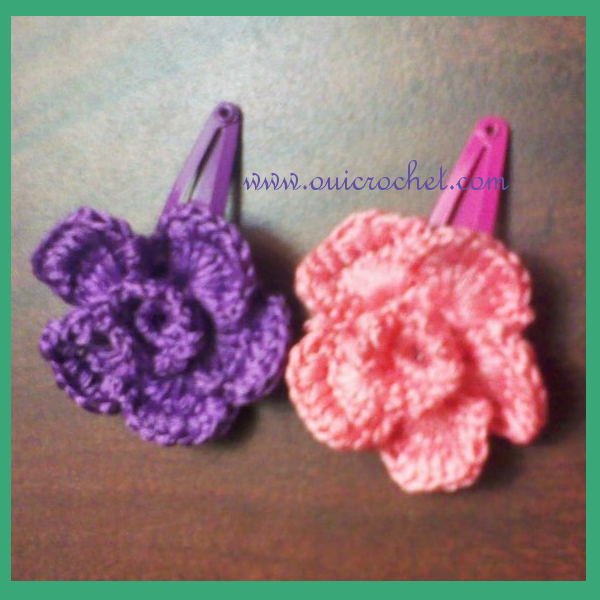 These cute little buttons and bows hair clips are a great little craft that can be made in no time at all! They are perfect for stash -busting, as they use very little yarn and can be made is so many different colors. You can get creative with fancy buttons and clips, or keep them simple. As I mentioned, these clips work up very fast. If you need something to fill your craft booth or need a last minute accessory, gift, or little girls' party favor, these would be perfect! Position your bow where you want it on your clip and hot glue it in place. Hot glue the button to the center of the bow. 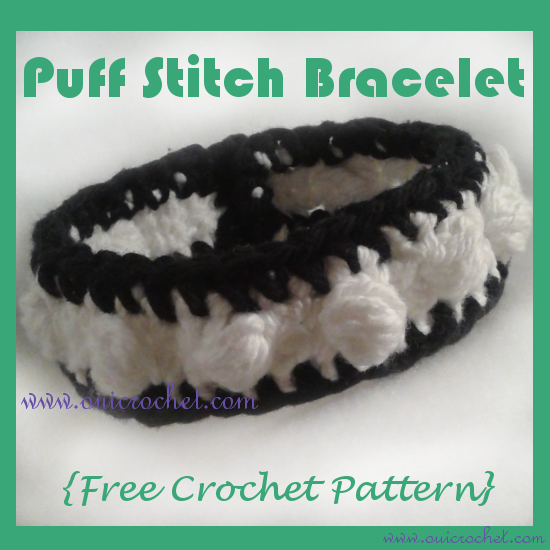 I think crochet jewelry has a very special elegance and charm. 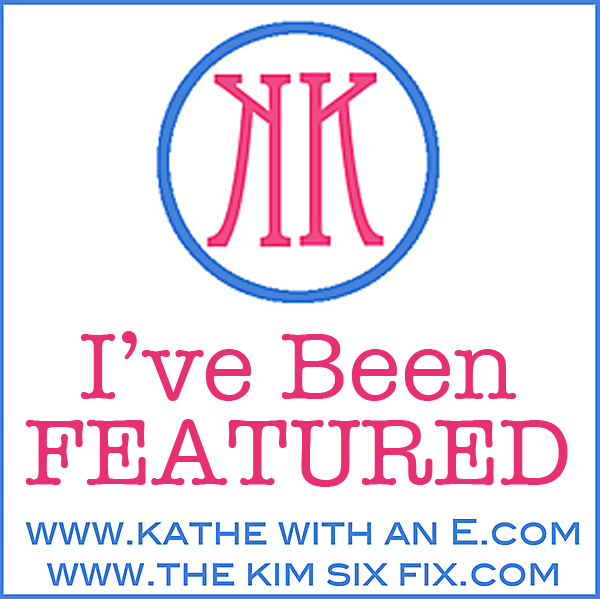 You may have seen the Picot Necklace that I shared a couple of weeks ago. This Small Shells and Picot Necklace follows the same simple, yet pretty trend. You can use whatever color thread you like, but I chose to keep mine white. I think a thread with a metallic or a pearl strand in it would be exceptionally pretty for this necklace. The charm or pendant can certainly be left out, but I like the look of it, and the extra weight it adds to the necklace. You will want to block your necklace after you make it. 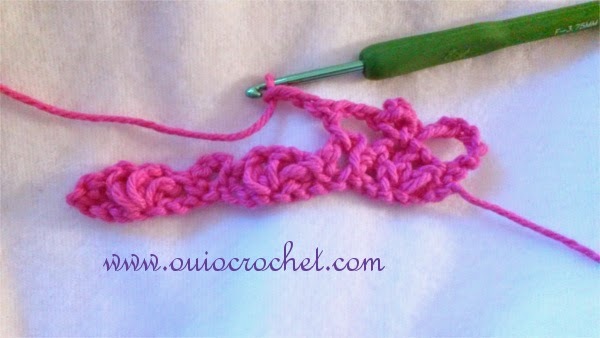 This will prevent curl ups and allow your stitch-work to show through nicely. You can even lightly starch your necklace, if you like. A button for the "clasp"
small shell cluster- hdc, dc, hdc, all in same stitch, skip next st, sl st in next st (you will begin next shell cluster in the stitch you just sl st in). Make a slip knot in your thread, leaving a 6-8 inch tail. ch 12. Join with sl st to first ch to form a ring. Do not turn. ch 1. Make 24 sc inside the ring. Join with sl st to the first sc. Pick up tail, and working with the tail and the thread together, ch 3. Drop tail. Still working with the attached thread, ch 139, being careful not to twist chain. Sc in the first 8 sts. Ch 1. Turn. Sc in each of the 8 sc. Ch 1, Do not turn. Working in the back side of the foundation chain, sc 8. Continue to sc across until you get to the tail you dropped before. Pick up the tail and working with your thread, sc in the last 3 ch. Sc in the first sc of the button loop. Drop the tail. Ch 1. Turn. Sc in next 3 sts. Work the small shell clusters across, until there are just 10 stitches left. Sc in last 10 sts. Turn. Ch 1, sc in first 8 sts, sl st to first dc. [Work picot st, sl st in dc of next shell] repeat across. When you reach the last shell, sl st into the next sc. Finish off. Weave in ends. Block. Attach button and a pendant or charm. This Pack-n-Play toy organizer not only hangs on the end of the Pack-n-Play, but it doubles as a take along bag for baby's toys. The toy organizer makes a unique baby shower gift, and can be coordinated with Baby's nursery colors. The toy organizer has straps so that it can hang on the end of a Pack-N-Play. This comes in handy when removing toys for nap time or changing sheets. The optional large pocket in front is a nice spot for books or diaper changing supplies. Untie the straps, and they act as a drawstring to close up the "bag" when going on an overnight trip or packing up the Pack-N-Play. Row 50: Ch 3, dc in first 2 dc, *dc in ch 1 sp, dc in next dc* repeat from *to* across. Dc in last dc. 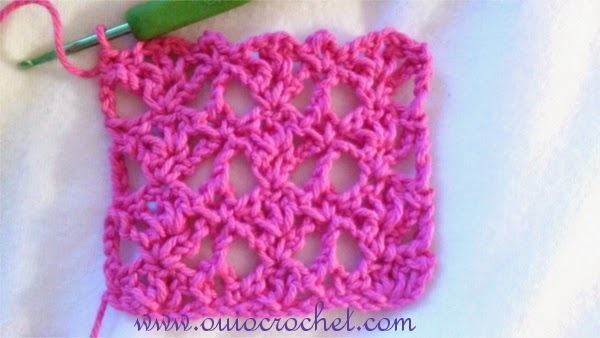 Make a 12 inch granny square of your choice. I followed this tutorial, continuing to make it 12 inches. Ch 100, sl st in each ch. Fold the main piece in half, lining up rows 1 and 50. Using a yarn needle and yarn, sew side, starting with rows 2 and 49 (leaving rows 1 and 50 unsewn. Sew all the way down, and repeat on the other side. Sew the pocket on the front. Weave one tie through the dc row on the top front, and repeat for the top dc row on the back with the other tie, leaving the ends for tying to the Pack-N-Play. Everyone needs a good all-around bag. They just do. 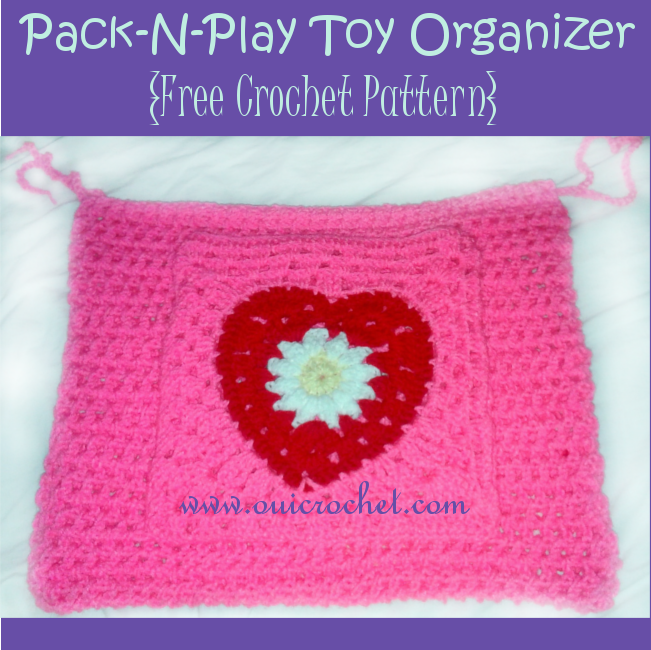 You are in luck, because this is that bag, and with crocheting as your super-power, you can make it! 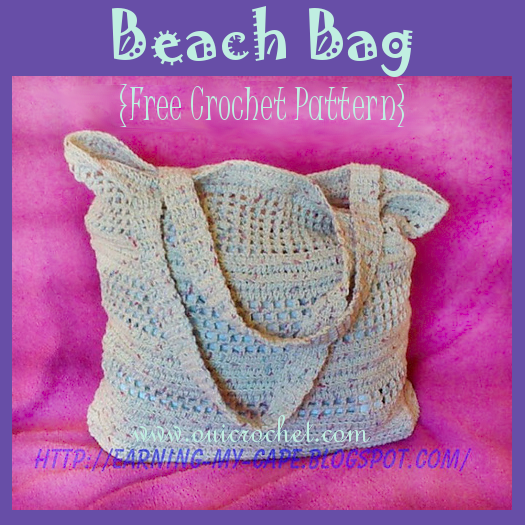 This bag is great for a day at the beach or even a trip to the market. It is big, roomy, and washable. What more can you ask for? The loose construction allows for flexibility and expansion if you tend to over-stuff. The bottom of the bag is made with tighter stitches so that things like Chapstick or coins don't fall out. 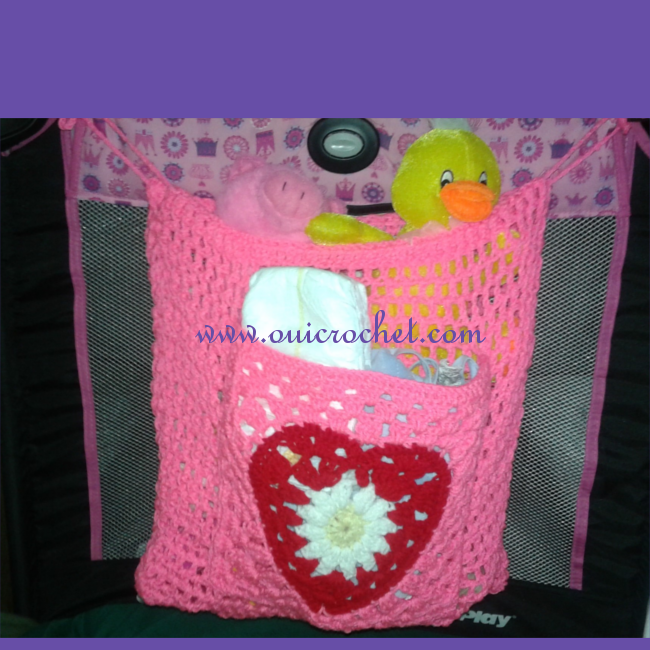 The netted sides allow the bag to "breathe" in case you have to carry around a wet towel or clothing. It is also great for attaching things like a water bottle or cell phone case with a carabiner clip. Rounds 11-16: Repeat rounds 9 and 10. Round 17: Ch 3, [dc, ch 1, skip next stitch, dc in next stitch] repeat around. Join. Round 18: Ch 3, [dc, ch 1, dc in next dc] repeat around. Join. Round 19: Ch 2, hdc in each dc and in each ch 1 space, around. Join. Round 20: Ch 2, hdc BLO in each hdc around. Join. Round 21: Ch 2, hdc FLO in each hdc around. Join. Rounds 22-25: Repeat rounds 20 and 21. Round 26: Repeat round 17. Rounds 27-30: Repeat round 18. Round 31: Repeat round 19. Rounds 32-35: Repeat rounds 20 and 21. Round 36: Repeat round 17. Rounds 37-42: Repeat round 18. Round 43: Repeat round 19. Round 44: Repeat round 20. Round 45: Repeat round 21. Round 46: Ch 2, hdc (in both loops) in each stitch around. Join. Finish off. Rows 3-57: Repeat row 2. To Attach: Being careful not to twist the handle, skip 29 hdc from the 5th hdc in row 1, attach with slip stitch to the 30th hdc. Sc through the hdc of the hands and the next 5 hdc of the bag. Finish off. To Attach: Being careful not to twist the handle, skip 29 hdc from the 5th hdc in row 1, attach with slip stitch to the 30th hdc. Sc through the hdc of the hands and the next 5 hdc of the bag. 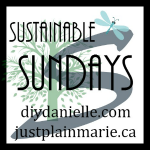 If you have been on Pinterest at all, there is no doubt that you have seen some of those herbal and natural hand made soap tutorials. I'm not sure about you, but for me, if I am going to go through the work and care that it takes to make my very own awesome herbal soap, I don't want to waste a bit of it! 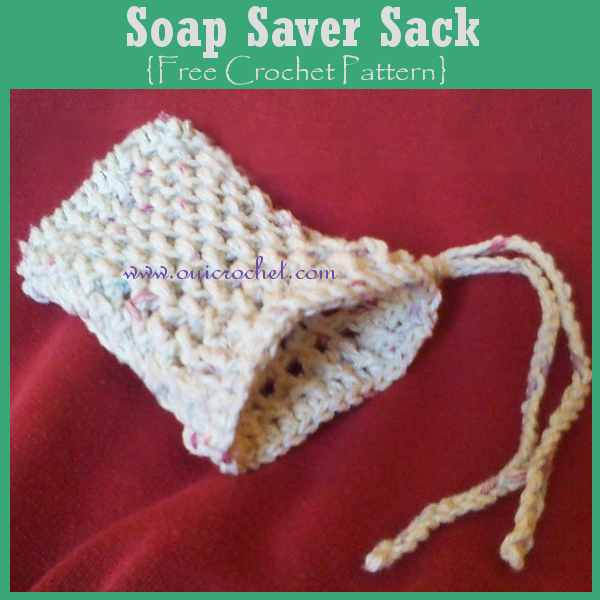 Enter the soap saver sack. I'm sure you've seen them. Cool, huh? What is equally cool is how quick and easy they are to make. You will not only want to make one for yourself, but for friends and family, too. 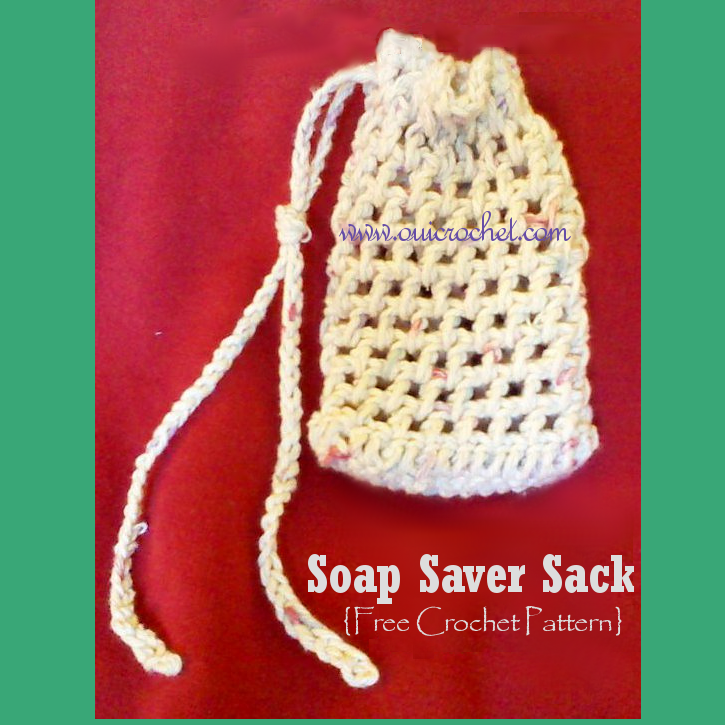 They would make a wonderful addition to a natural soap gift basket. Round 5-11: Repeat round 4. Round 13: Ch 1, sc in each st around, join. Ch 100. Finish off and weave in ends. Weave tie through the top dc round.